I’ve always felt that the most important thing about cooking at home is striking the balance between convenience and what you actually love to eat. I don’t want to be sweating over a trough of cassoulet every night, even though it’s my favorite dish and I wouldn’t mind eating it that much. But I also don’t want to be trudging through different variations on pasta with tomato sauce because I’d go insane. So I always tell friends, who are trying to become better home cooks, to figure out a few dishes that they really enjoy that don’t take too much effort and learn how to make those, even if it takes a little bit more time than frozen tortellini (obviously if this is your favorite dish, you are one of the lucky ones). The whole point of cooking for yourself is to make things you really like, that your loved ones like, without paying $20 a serving plus tip. Roasted sweet peppers feel like the kind of thing that you can only get in an antipasti spread, or in a jar for $15 or more. If you really love roasted peppers, learn how to make them at home, and just like that, they can be a part of your everyday cooking. If you really love those blistered shishito peppers that come as $12 appetizers, learn how to make them at home, and they’re your new go-to snack. Peppers epitomize the balance between what is easy and what I like to eat come late summer. I always have hot chiles on hand whenever the urge strikes for curry, guacamole, salsa, or even just roughly chopped and added to roasted vegetables. Both sweet and spicy chiles add deep, complex flavor to dishes without being fiddly to prepare, which makes them the ideal companion for the home cook. Experimenting with the different uses and flavors they bring to the table can transform your typical routine. So dip your toes into the world of chiles with me, and I guarantee you’ll want to dive in. Green Bell, Purple Bell, Red Bell, any color bell: Robust and crisp, these super sweet, tangy peppers are perfect for frying up on the stovetop or dipping raw in hummus (a kid-approved snack). Corno di Torro, Escamillo Sweet Frying Pepper, Jimmy Nardello: Choose these smaller, more complex, sweet varieties for roasting under the broiler or over an open flame on the stove. They take on a smoky flavor when charred. Shishito, Padrón: These are very mildly spicy green peppers, which you can eat whole pan-fried or oven-roasted. About one in ten of both of these varieties are hot, so it’s kind of like a fun, Russian Roulette game of spice. Add a pinch of salt and a dipping sauce (perhaps some tzatziki? ), and you’ll forget about potato chips for a few months. Poblano: These green beauties are mildly spicy and crazy delicious. Use them in black bean soup, chile relleno, Southern red rice or any other dish that needs a tiny kick in the pants. 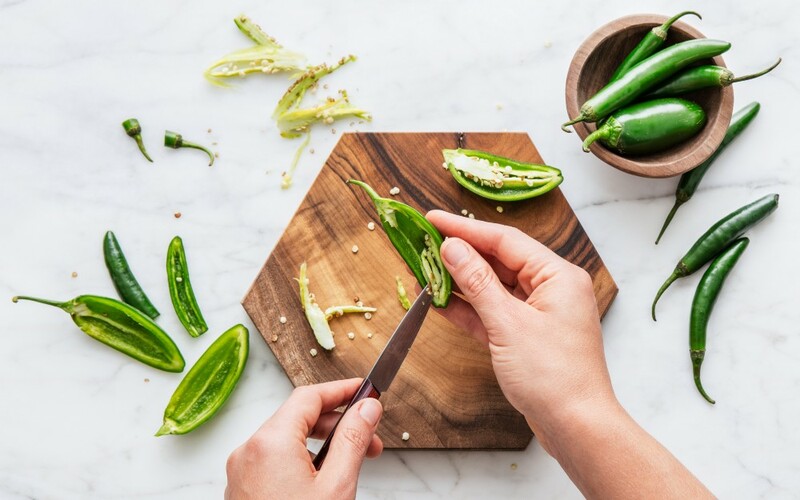 Jalapeño: This is the hot pepper we’re all most familiar with — grassy, green, and super crunchy and juicy. Finely dice these into fresh salsas, guacamole, roasted vegetables, or pretty much any dish that needs a bigger kick in the pants. Hot Wax: These lightly yellow zingers are so named for their spiciness and waxy skin. While they’re just a bit hotter than jalapeños, they have a completely different taste — more tangy and fruity. They’re awesome to cook with or use raw, sliced into salads. Serrano: Serranos are another grassy, green pepper, which can take the place of jalapeños in any dish if you want a little bit more spice. They are slightly brighter, but taste very similar to jalapeños (they’re also this writer’s pepper of choice). Cooking or charring serranos before using them can mellow out the spiciness if you love the taste like me, but don’t want everything you make to be really spicy. Cayenne: The fresh cayenne is the hottest pepper on this list. You’re probably most familiar with this one in its dried, powdered form, a pinch of which can elevate and enhance the flavors of almost every dish (I know people who put a pinch in desserts). Just like many other peppers you can throw these into stir fries, salsas, and the like for an extra spicy bite. Store pristine peppers in a plastic bag in the crisper drawer for 1–2 weeksor even longer in some cases. Bell peppers may not last as long as your smaller peppers, so just keep an eye out. You want to make sure they stay very dry during their visit. Peppers have pretty awesome staying power, so you can buy them a week or so in advance without worrying they’ll go bad. When they do, the flesh will become a little squishy and the skin will start to wrinkle. Though they may no longer be dip-in-hummus-worthy, you can still use them in a stew or sauce. Cutting a bell pepper is really all about getting around all those pesky seeds in the easiest possible way. Instead of cutting the pepper in half, then ripping the pith out with your hands, stand the pepper up and starting from the top — right near the stem — cut downward around the pith with a sharp knife (almost the same motion as cutting the rind off an orange). Repeat that motion all the way around the pepper, toss the stem and seeds, and you’re good to go. For some of the frying peppers, like Padrón, Jimmy Nardello and Shishito, there’s no need to de-seed before blistering in a hot pan. For some of the bigger sweet ones, like Escamillo or Corno di Torro, run a small knife around the stem and pull it out, seeds and all to maintain the beautiful shape. If you’re catering to those with less of a spice tolerance, or want to control the amount of heat in a dish, you might want to de-seed your peppers. Some recommend that you lie the pepper down and cut around the pith, but I find that doesn’t always work for smaller peppers like serranos and jalapeños. So my favorite method is to cut the chile in half and scoop out the seeds and white pith (which is actually the hottest part) with a small spoon. Don’t forget to wash your hands very thoroughly with soap after handling hot peppers, and don’t touch your eyes, face, or… anywhere else. Trust me, I’ve seen the spice get in some places you really wouldn’t care to experience — it ain’t pretty. Using tongs over an open flame or the turning often under the broil setting on your oven, roast sweet peppers until the skin is deeply charred. Throw these in tomato sauces for a sweet, smoky richness or get some good creamy cheese and eat simply on crusty toast with a pinch of salt. For an even more permeated smoky flavor put the charred peppers in a bowl right after roasting and cover with plastic wrap to steam. For roasted green chile and tomatillo salsa, throw tomatillos, green chiles of your choice (deseeded or not), onion wedges, and whole garlic cloves on a baking sheet. Toss with olive oil and salt, bake at 450 degrees for 6–7 minutes, toss the veggies again, then bake for another 6–7 minutes. They should be soft and charred up wonderfully. Put everything in a food processor, blender, or (my favorite) Magic Bullet with a handful of cilantro and a squeeze of lime juice and blend to your desired texture. My favorite way to use this is in crazy simple chilaquiles, which are a truly spectacular 15 minute weekend breakfast. I’ve been raving a little bit about this snacking revelation, but pan-fried Padrón peppers have become my serious go-to for a quick bite. Simply heat up a pan on really high heat (like, really high heat), pour in a splash of olive oil and carefully place in your peppers. They’re going to sizzle and pop immediately so be wary of oil splashes. Give the pan a shake and toss the peppers until you have an even char to your liking. Take off the heat and hit with some salt — my favorite is Lawry’s seasoned salt.